Ford India is about to launch the Freestyle into our country’s ever-growing car market. Being touted as the country’s first ‘CUV – Compact Utility Vehicle’, the new Figo-based crossover features the company’s SYNC3 infotainment unit, which offers Apple CarPlay and Android Auto. Also, the company’s new 1.2-liter motor from the Dragon series of engines will debut in India in the new Freestyle. Bookings of the new Ford Freestyle will start on 7th April 2018. 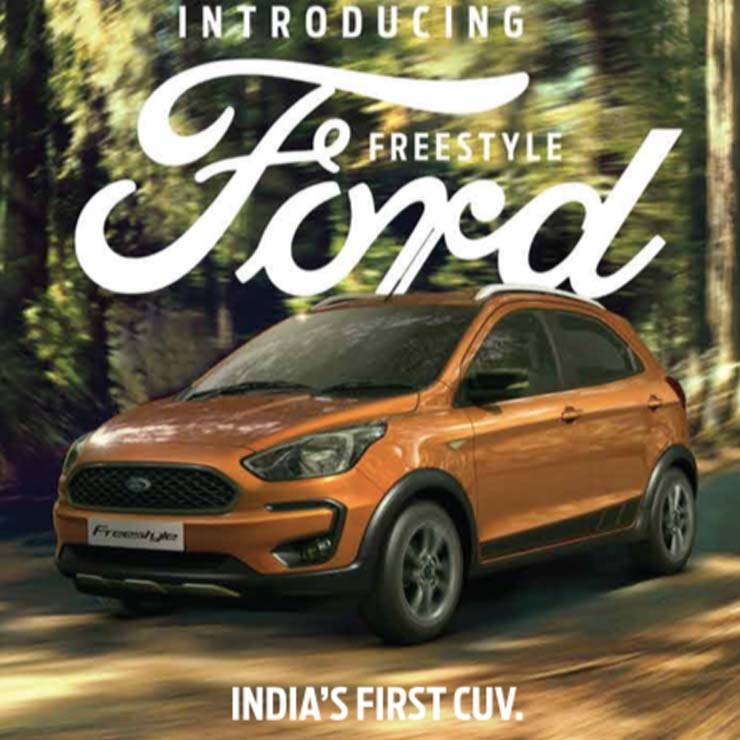 The official website of the upcoming car went online earlier today and the online brochure has revealed all there’s to know about the Figo-based Ford Freestyle. The new Ford Freestyle will launch with two engine options – 1.2-liter Petrol and 1.5-liter Diesel. The new petrol engine outputs a maximum power of 96 PS and offers a claimed mileage of 19 kmpl. On the other hand, the 1.5-liter diesel engine offers a maximum power of 100 PS along with a peak mileage of 24.4 kmpl. The petrol variants will weigh up to 1044 kgs while the diesel models will weigh up to 1080 kgs. Both the motors will come mated to a five-speed manual transmission. The new car will go on sale in five colors – Moondust Silver, Smoke Grey, White Gold, Oxford White, and Absolute Black. There will be four trim levels on offer – Ambiente, Trend, Titanium, Titanium+. All the variants come equipped with ABS, front dual airbags, EBD, engine immobilizer, reverse parking sensors, keyless entry, approach sensors, perimeter theft alarm, seat-belt reminder, and automatic relock at 15 kmph. Additionally, all variants except for the Ambiente trim offer a reverse parking camera. The top-end trim (Titanium+) offers Active Rollover Protection (ARP), side and curtain airbags, and Emergency Assistance. The fully-loaded Freestyle also gets power fold outside mirrors, electrochromic inside mirror, automatic climate control, and Ford MyKey. Also, only the top-of-the-line trim gets Ford SYNC3 infotainment unit. This system offers voice controls and connectivity features such as Apple CarPlay and Android Auto. 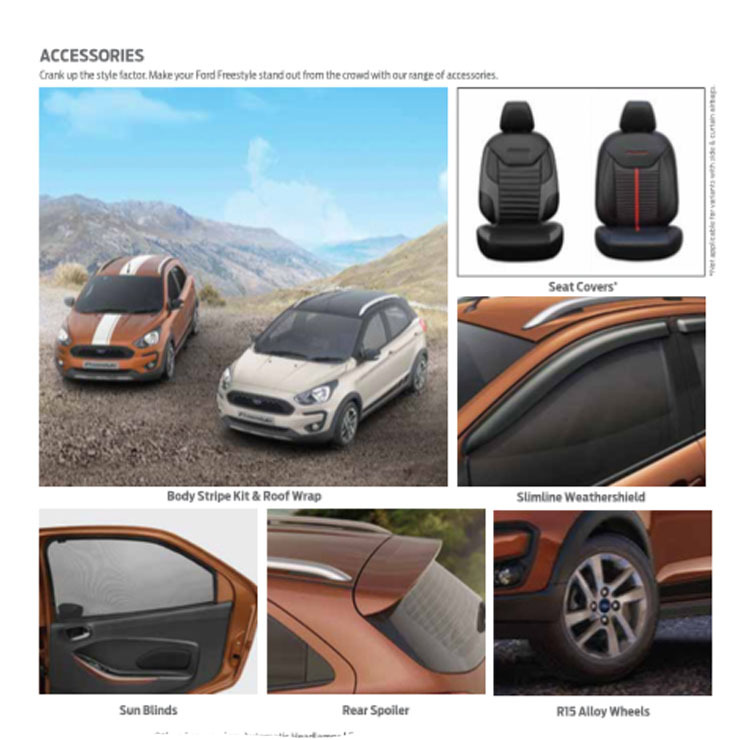 The brochure reveals that the company will even offer a handful of official accessories for the Freestyle. These include- body stripes, roof wrap, seat covers, window visors, sun blinds, rear spoiler, automatic headlamps, engine undercover, anti-theft nuts, neck rest and pillow, roof rails, smart ambient lighting, shark fin antennae, and attractive 15-inch alloy wheels. The new Ford Freestyle will find itself slotted between the Figo and the EcoSport in the carmaker’s product portfolio. Prices are likely to start at Rs 6.5 lakh. Stay tuned for more details.